It’s one of his constant refrains, and when he says it, he puts his hand to his heart with a slightly melodramatic air and smiles, shaking his head and making a face as if he’s really touched or just goofing off. It’s a little bit of both – PbeeMai is equal parts sincerity and lightheartedness. In this case, he’s talking about Brian, an American who did campus outreach at the university PbeeMai attended. According to PbeeMai, Brian reached out particularly to the students within the department of physical education, which included PbeeMai. It is rare in Thai culture to be invited into someone’s home, but Brian regularly opened his home to a group of about ten of the PE students to eat and hang out. Pbeemai helping facilitate a Sports Friends Basic Training - photo courtesy of Pbeemai Yindeeram. PbeeMai says he was that way too. He was also like many other twenty-year-olds – looking for validation from his peers, wanting to be well-liked and popular. But he saw something different – something perhaps even worthwhile – in the way Brian welcomed students into his home and built relationships with them. Brian played futsal with the PE students and shared about Jesus and the Gospel during their five-minute breaks. No one really paid attention. Though it wasn’t as immediate, this would also touch PbeeMai’s heart and gradually become more real in his life. He began to go to church and spend time with Christians and he saw the love in the community. But he couldn’t shake his old habits – going out to nightclubs, drinking – things that he did with his peers in order to fit in and be liked. He describes it as being like having a delicious cake in front of you that you know you shouldn’t eat. He wanted to “be good,” he said. This idea is common in Thai Buddhist culture, in which belief in karma shapes one’s actions and doing and being good are valued for boosting one’s “merit” for their next life. PbeeMai talks about one night in particular, when he had gone out drinking: it was two in the morning but he hadn’t had enough yet and wanted to keep going. He somehow wound up on the side of the street, sitting on the sidewalk and feeling like he was fighting a battle with himself for who he wanted to be and the feeling of helplessness that he couldn’t change. That realization pushed him to turn to Jesus, and today he works with Sports Friends, coordinating the ministry in the Bangkok and Isaan region of Thailand. He checks in with people who have gone through the Basic Training, continues building into relationships, and participating in camps and trainings. “I love the kids and I feel so encouraged by the coaches. Some of these kids don’t even have soccer shoes at some of the camps we do, but they still come,” he says. It is something that touches his heart – seeing the relationships sports can foster. PbeeMai knows that athletes can be arrogant, angry – but in his new work he sees children who are humble enough to want to learn, even without proper equipment, and coaches who are patient and generous with those around them. 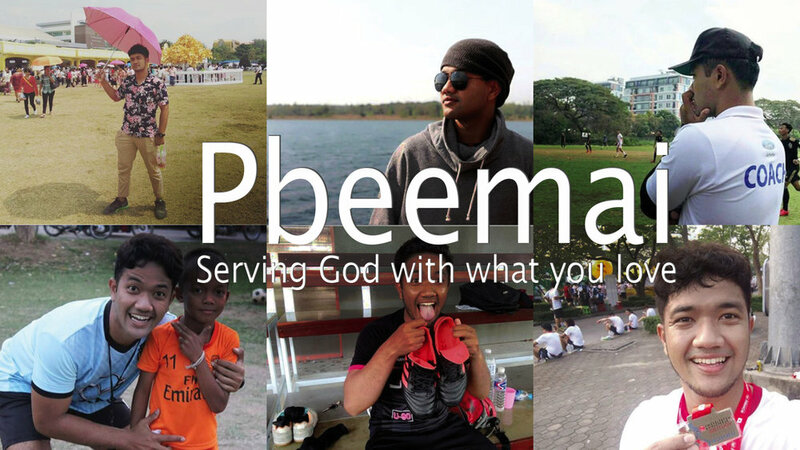 There were parts of PbeeMai’s life that he left behind when he began to learn more about Jesus, and grow in deeper relationship with him. The anger and pride, the need for popularity, the nights out drinking and partying. But other parts have remained – his love for football, his dedication to the game. “I had never thought that there would be a way for me to serve God through sports. I had no idea,” he says.